Posted by CCLD in Van Etten. While visiting the Van Etten Library young patrons can stop at the Early Literacy Center, a special place for our youngest patrons to use educational material and enjoy fun activities. Some of the fun and engaging items include an art easel, alphabet magnets, image-word matching games, chunky puzzles, and LEGO sets. So stop in and check out the ELC, be creative and have fun! Posted by CCLD in Van Etten, Youth Services. Soon the Van Etten library will offer resources (in addition to books!) to help our youngest patrons get ready to read. The skills needed to begin learning to read are required long before children start school, so it’s never too early to introduce children to simple, yet engaging activities that promote reading readiness. What better place to go than your local library? While visiting the Van Etten Library the little ones can stop at the Early Literacy Center, a special place for our youngest patrons to use material and enjoy fun activities. The goal for implementing the Early Literacy Center is already set into motion with completion expected by the end of this June 2016. Here you will find activities, toys, and books that engage children of all ages; from newborns to toddlers and pre-schoolers to school aged children. Some of the material for the ELC is made possible from generous donations given to the Van Etten Library by our patrons. A few of the exciting and engaging items that will be purchased include an art easel, alphabet magnets, image-word matching games, chunky puzzles, and LEGO sets. The concept of the center will be parent friendly as well. All of the centers activities will be available on an in house check–out basis. This means that the kids will need to get permission from the parents to use the center, and then check out the specific items that they choose to use. This way, if parents are just running into the library quickly, they can do so without the “challenge” of trying to get their kids out when they would rather stay and play & learn. So, stop by the Van Etten Library and check out our new resources that will aid in promoting reading skills for our youngest patrons by providing hands on activities to explore, create and imagine!! I could not believe how excited the younger patrons became when they learned that the library now had a fish. They would walk in the door and run right over to look at the fish sitting on the shelf at the circulation desk. So many questions about the fish; “Where did he come from?”, “What does he eat?”, “How old is he?” Once, I took the fish home on vacation with me. While I was away so many young ones asked where the fish had gone. My sub, Ms. Doris Jean, simply told them that he went on vacation with Ms. Michelle. On one occasion, a mom came rushing in to check if the fish was here, and she then said, “Oh good the fish is here!” She then shared with me that her two children were so excited about seeing the library fish that it was all they talked about the entire car ride to the library. So we began a contest to name the library fish. We had some very creative entries; Red, Beto, Nemo, Kitty, Beanie, Sunflower, Brutus Buckeye, Bubbles, and the list went on with 25 potential winners. The difficult part was choosing the best name for the library fish. We really wanted to pick a name that would reflect some of the character of the Town of Van Etten and its residents. The most popular name on the list was ‘Finn’, with three entries. Since this was the most popular entry, I decided to go with it. But, not just because the fish literally has fins…the town of Van Etten actually has many residents of Finnish descent. According to the Tioga History website, around 1909 the Finnish people began to move into the Van Etten area and purchased impoverished farms. They then created the Spencer Cooperative Society which sold everything from groceries and feed to farm equipment and hardware (Alve, tiogahistory.org/Site/Spencer.html). The New York Folklore website explains how many of the Finnish that settled in the Finger Lakes region were leaving the mines and factories of the Midwest in search of farm land. Over the next few decades about five hundred Finnish landowners arrived in the Finger Lakes. As dairy farming began to decline in the area, the Finnish revitalized farming in the region by starting chicken farms (http://www.nyfolklore.org/tradarts/archcoll/flarch.html). With the poultry industry in the Spencer/Van Etten communities becoming such a very large business, the Spencer Cooperative Society also began buying and selling eggs (Alve, tiogahistory.org/Site/Spencer.html). I recently spoke with a Van Etten library patron who recalls working for the co-op years ago. She stated that the co-op was a vital part to the community in supporting the supply and demands of that time. She also explained that during WWII due to the rationing of other meats and with chicken being very viable and plentiful, the Van Etten community thrived with its chicken farms. In fact, if you were to take a drive down the main road through Van Etten today (NY 224) you can see the many abandoned chicken houses used decades ago by the Finnish chicken farmers. So, if you ever find yourself in this neck of the woods, you will know exactly what those big abandoned white buildings with many windows are, and you will remember their great importance to the Van Etten community at one time. You can also stop in and say hello to our Van Etten Library fish…Finn. Posted by CCLD in Community, Van Etten. Summer is here, hard to believe after another long, cold and snowy winter. Where does the time go? The start of the Summer Reading Club will be here before we know it as well. The garden club will meet on Wednesday mornings to weed, water and maintain the garden. Our goals are to maintain a successful garden with optimal harvesting of produce, share our produce with the community and look into the possibility of recycling seeds for next year’s garden. All produce not consumed by club members or library patrons will be donated to the local farmers market on behalf of Ms. Teri Carling (local gardener, nursery owner and farmers market participant). Teri has helped the Van Etten library immensely in planning our garden. From all of us at VE, thank you Teri! Our seedlings at 18 days old…. The Super Foods Community Garden is funded in great part by a generous grant received from Inspire of Spencer-Van Etten. Inspire is a non-profit public charity supported by donations from individuals and organizations and grants from foundations. Thank you Inspire. It is our hope that the Super Foods Community Garden will provide adults and children with the knowledge and skills to create their own gardens and grow healthy food. This project will also provide lifelong learning skills, and encourage and enhance overall health. Gardening knowledge promotes the economic advantages of growing foods at home and harvesting and recycling seeds for future gardening seasons offers a money saving technique. There are numerous at home gardeners and nursery owners in the Van Etten area, and many are willing to share their knowledge. The Garden Club members are all filled with great anticipation to see if our “green thumbs” will be green this year. Wish us luck! Posted by cclddirector in Big Flats, Bookmobile, Community, Director's Comments, District News, Horseheads, Programs, Steele, Van Etten, West Elmira. When you go out to dine you might use a credit card to pay for your food. When you get gas for your vehicle you may use a debit card. But did you know that, when you want to pick up some brain food or fuel your imagination, you can use your library card? In fact, you can use your library card to go everywhere, meet everyone and do everything. There are no limits to the usefulness of a library card. The Chemung County Library District is joining libraries nationwide in celebrating September as National Library Card Sign-up Month. Chemung County residents are invited to stop by their local branch and, if they don’t have a card, and get one. After all, they’re free to citizens of Chemung County. As part of the activities for the month, patrons will have the opportunity to enter a drawing for an iPad, Kindle Fire or Kindle Touch. Entries can be made in any of three ways- get a new card, update your current information, or sign up for our electronic newsletter. New York State residents, ages 5 and older, who come to the library qualify to receive a free library card. In order to get a library card, applicants are required to complete and sign an application signifying their agreement to adhere to CCLD policies. Children age 5 – 15 years must have their application co-signed by their parent or guardian. Applicants must present identification before being issued a library card. Parents or guardians of children age 5 – 15 years must present proof of address on their behalf. The most appropriate form of identification is a New York State driver’s license. Also accepted will be a NYS auto registration, a personal checkbook with printed current address, a letter postmarked to one’s current address, or another official document with one’s current name and address. Your library card allows you to partake of all the services CCLD has to offer—online database usage, eBooks, free entertainment and educational programs, homework and business help, and, of course, DVDs, CDs, print and audio books. Another added benefit is that your library card may be used at any CCLD branch- the Central Library (Steele Memorial), Big Flats, Horseheads, West Elmira, Van Etten, and The Bookmobile. Your library card also allows you to access materials at all Southern Tier Library System Libraries throughout Alleghany, Schuyler, Steuben, and Yates counties. Call or visit your local branch for information about programs scheduled in celebration of National Library Card Sign-up Month! To find your local branch, visit http://ccld.lib.ny.us./index.htm. Stop by your local branch during the month of September and get a library card—then you can stop by every month for the rest of your life to use it! Posted by metzgerd in Community, Van Etten. I accidentally locked myself out of the Van Etten Library a few weeks ago. I walked to the neighbor’s house and tried calling all the town officers to see if anyone could let me back into the municipal building. It was a Saturday, so no one was home. The neighbor realized that everyone in town was probably at a memorial service at the church. Feeling rather embarrassed, I followed the neighbor over to the church where the memorial service was ending. We found the Town clerk, who cheerfully announced to everyone as she made her way through the crowd, “the librarian has locked herself out of the library; I have to go let her in!” Now practically the whole town knew I was in a silly predicament! It was embarrassing, but also very funny. And this is why I love rural librarianship in a small village. Getting to know everyone, building relationships, and helping patrons, is integral to being a good librarian. That’s true of librarianship in every setting, but it is especially noticeable and vital in a small community. I get to know almost everyone (who walks in the library door). And they know me! 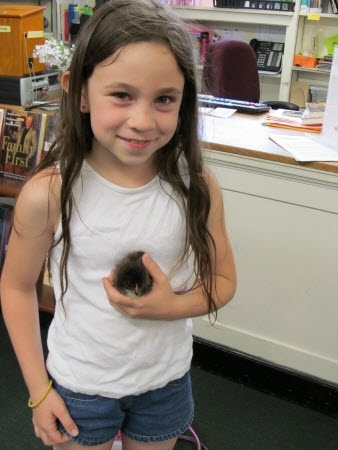 Alyssa raised a fluffy black chick in school (pictured above); she brought it to the library in a hot pink bag to show me. I was thrilled. Jacie regaled me with tales of riding the zipline at the Girl Scout’s camping weekend. Cathy overheard me saying that I wished I had an old wooden ladder for my container garden. She showed up at the library next week to surprise me w/ a rummage sale wooden ladder poking out of the back of her car! All of this reminds me how important, and reciprocal, relationships are. I’m very fond of my library patrons because I got to know them over time. Knowing who they are, their likes, dislikes and needs help me provide programs, services, and information tailored specifically to them. Whether it is a burst water pipe, a school project, rewriting a resume, (see JobNow ) how to prune old apple trees, or surviving a zombie attack, I’m here to help this community who in turn, helps me by creating meaning, hilarity, and joy in my life. Posted by metzgerd in Van Etten, Youth Services. A six-year-old girl just came in with her grandpa. Tayla couldn’t find any picture books to suit her, so Grandpa & I selected books we thought she might like. 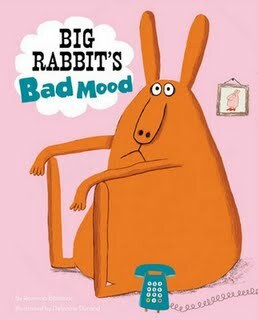 At random, I pulled out one called: “Big Rabbit’s Bad Mood.” I laughed inwardly, because I happened to be in a Bad Mood myself, although I was successfully acting cheerful on the outside. On impulse, I plopped down and read part of the book to Tayla, making growly voices for the Big Bad Mood as he followed Rabbit, “stuck to him like glue.” I wanted to get Tayla interested in the story, but I also wanted to know how Rabbit got rid of his Mood, for me! Just as Rabbit got a “very, very brilliant idea” about how to get rid of his Bad Mood, I clapped the book shut. I told Tayla that she should take the book home to read and then tell me what Rabbit did about his Mood so I could get rid of mine. I was rewarded with a small, shy smile. Tayla decided to take the book home. Grandpa told me that Tayla often pretends she’s a librarian and makes him check his books in and out properly at home. I beamed at Tayla, amazed that I had made any impression on this quiet little girl, who has barely looked me in the eye or said three words to me in all the time I’ve known her. I still don’t know what Rabbit did to get rid of his Big Bad Mood. But Tayla, her grandfather, and finding the right book for them (and myself), rid me of mine. The thrill of finding the right book, (or information), at the right time, for the right person. I love being part of that, and this library profession that holds that process at its center. Posted by metzgerd in Van Etten. Van Etten Library extends a heartfelt thank you to Ralph Moore and the Family Reading Partnership of Chemung Valley for the new “Read to Me!” banner now gracing the library exterior wall. The banner features artwork by Elmira children’s book author Tedd Arnold. Van Etten library patrons and staff love the new look! The banner improves the aesthetics of the library exterior and conveys the presence and location of the library to the community.